A Hungarian man has been arrested after 12 people were rescued from the back of a lorry he was driving. 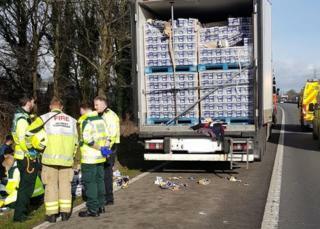 Leicestershire Police Armed Response team tweeted that a call came from inside the lorry "asking for help" on the M1 northbound at about 10:00 GMT. An air ambulance was called and two lanes had to be closed causing long queues from junction 20, near Lutterworth, Leicestershire. The 59-year-old man is being held on suspicion of immigration offences. Eleven men, who presented themselves as being Iranian and Iraqi, have been taken into police custody pending transfer to the Home Office. A minor will be passed to social services, a spokesman said, and all of their cases will be dealt with according to immigration rules. Immigration Enforcement was contacted by Leicestershire Police at about 11:25 GMT after the force stopped the vehicle, following concerns for the welfare of the people inside. A 59-year-old man was arrested and is now the subject of an ongoing investigation led by Immigration Enforcement Criminal and Financial Investigation (CFI) officers. Several people can be seen in a picture tweeted by the armed response team, receiving treatment from paramedics. The back of the lorry is piled high with pallets with a small gap at the top. All of those found were treated at the scene by medical staff.